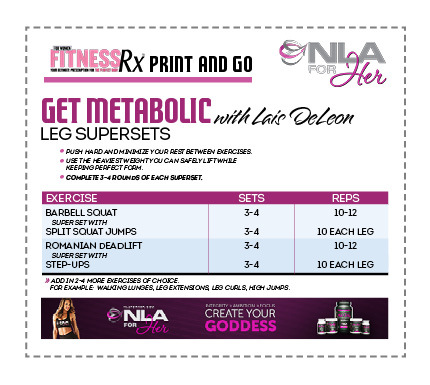 Blast through a plateau, re-energize your training and get results with Lais DeLeon’s GET METABOLIC Workouts presented by NLA For Her. Her High Intensity Resistance Training programs will amp up your intensity, challenge your strength & endurance and boost your metabolism (yes, we’re talking about the afterburn) to help you sculpt the lean & tight body you desire. Today’s High Intensity Circuit hits the LEGS with compound movements and plyometrics. Watch the video for a demonstration of the workout and top tips from Lais.